Welcome back to the TJGT Alumni Spotlight, we hope you are having a great start to 2019! 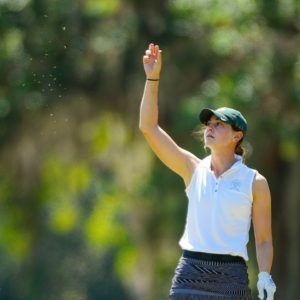 In this week’s spotlight is long time TJGT alumni player and collegiate golfer at Baylor University, Maggie Beth Byers! During her time with us on the Texas Junior Golf Tour, Maggie Beth competed in 33 tournaments. Out of those tournaments she had 9 first-place finishes, 10 runner-up finishes, and 6 Top-5 finishes. During her high school career, she was a three-year letter winner at Churchill High School. She was name first-team All-State, All-Region, and All-District as senior in 2013. 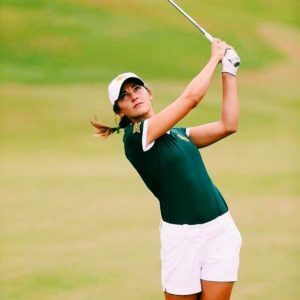 Her time as a collegiate golfer at Baylor University was also quite impressive. She was a three-year letter winner. Played in 18 events over the first three seasons with over 50 rounds. She entered her senior season ranked eight on Baylor’s career stroke average list. She shot a career-best 68 in the final round of the 2014 Schooner Fall Classic. She was named to the Big 12 Commissioner’s Honor Roll in all 6 semester, 4-Time Baylor Dean’s Honoree, 2016 First-Team Academic All-Big 12, and was a 2-Time WGCA All-American Scholar, recognized in both 2014 and 2016. Here’s a little more about Maggie Beth!